Holistische kijk op klachten: het verband tussen lichamelijke pijn en emotionele pijn. Zoals je op mijn website hebt kunnen lezen, werk ik vanuit de holistische visie. Ik ben van mening dat alles met elkaar verband houdt. Bij een klacht kijk ik dus niet alleen naar dat kleine stukje waar jij pijn of ongemak ervaart, maar ik kijk veel breder. Hoe is het in je lichaam, hoe voel jij je mentaal, hoe sta je in het leven, welke thema’s spelen er op dit moment in je leven? Keer op keer zie ik hoe een klacht zijn eigen verhaal heeft en weerspeigelt hoe jij op dat moment in het leven staat. Op de website van “Healthy Holistic Living” kwam ik een artikel tegen dat deze holistische visie prachtig verwoord. Zeer de moeite waard om dit artikel (wat ik hieronder zal toevoegen) eens te lezen en te kijken wat jij hierin herkent danwel te onderzoeken wat jouw klachten je willen vertellen. En wil je hierbij wat ondersteuning, dan ben je welkom in mijn praktijk. Pain is first energy, second perception, and third physical manifestation. There is no other source of pain but energetic. Physical presentation is always secondary. Every single origin of pain in our bodies can be traced back to a specific emotional state which functions to warn us that there is still work to be done in areas of our lives for which we have yet to integrate lessons. Once we integrate those lessons, the pain disappears. 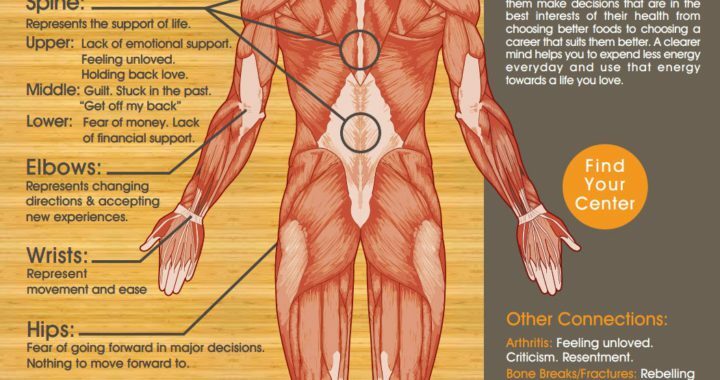 The body is extremely literal when it comes to pain. The experiences in your life directly mainfest in your body and when you encounter an emotional stress, your body shows you exactly what the problem is. The only thing you need to do is decode it. Pain In Your Muscles. Represents a challenging ability to move in our lives. How flexible are we being with our experiences at work, home or within ourselves. Go with the flow. Pain In Your Head. Headaches are contributed to not making a decision. Migraines are the daddy of headaches of knowing what decision to make and not making it.) Be sure to take time out of every day to relax. Do something that eases the tension. Pain In Your Neck. Pain in your neck is an indication that you may be having trouble with forgiveness of others, or even yourself. If you’re feeling neck pain, consider the things you love about yourself and others. Consciously work toward forgiveness. Pain In Your Gums. Like the neck, pain in the gums is attributed to not making a decision for yourself and not sticking to it if you did. Be clear, and go for it! Pain In Your Shoulders. Pain in your shoulders may indicate that you’re carrying a real emotional burden. That’s where the saying “shouldering a problem” comes from. Focus in on some proactive problem solving and distributing some of that burden to other people in your life. Pain In Your Stomach. Carries recognition of digesting life, or not. GI distress is about not feeling fulfilled. Leaving a hole and causing grief. Pain In Your Upper Back. If you’re feeling pain in your upper back, you’re probably coping with a lack of emotional support. You might be feeling unloved or you could even be holding your love back. If you’re single, it might be time to go for a date. Pain In Your Lower Back. Lower back pain might mean you’re worrying too much about money or you’re lacking in emotional support. It may be a good time to ask for an overdue raise or consider a financial planner to help you utilize money a little bit better. Pain In Your Sacrum and Tail Bone. You may be sitting on an issue that needs to be addressed. Get to the bottom of it and you will see resolution. Pain In Your Elbows. Pain in your elbows has a lot to do with resisting changes in your life. If your arms are feeling stiff, it may mean that you’re too stiff in your life. It may be time to think about making compromises and shaking things up a little bit. At the very least, go with the flow. Pain In Your Arms In General. You’re carrying something or someone as an emotional burden. It may be time to ask yourself why do you keep carrying it? Pain In Your Hands. With your hands, you reach out to others and connect. If you’re feeling hand pain, it may mean that you’re not reaching out enough. Try making new friends. Have lunch with an associate. Make a connection. It may also represent holding or letting go. Pain In Your Hips. If you’ve been afraid of moving, that may manifest as a pain in the hips. Sore hips could be a sign that you’re too resistant to changes and moves. It may also show a caution toward making decisions. If you’re thinking on some big ideas, it’s time to make a decision. General pain in the hips relates to support. When they slip out, it generally relates to an imbalance in how you are relating to life. Feeling the lack of love and support. Pain In Your Joints In General. Like muscles, pain in joints represents flexibility or lack of situations and your attachments to them. Be open-minded to new thoughts, lessons and experiences. Pain In The Knees. Seeing life as unsupported. Inside knee; Community, job, friends. Outside knee; personal issues. Humble yourself. Spend some time volunteering. Make sure you remember that you’re mortal. You’re just human and although you have an ego, don’t let it rule over your life. Pain In Your Teeth. Not liking your situation and repeating that dislike in your thoughts and emotions daily. Repeat to yourself that experiences are flowing through easily as you integrate perceived positive or negative experiences with ease. Pain In Your Ankles. Pain in your ankles may be a sign that you’re depriving yourself of pleasure. It may mean it’s time to indulge a little bit more. Spice up your romantic life a bit. Pain Causing Fatigue. Boredom, resistance, and denying what it takes to move forward, “What’s next?” Open yourself to that little voice which speaks very softly and nudges you towards a new experience. Pain In Your Feet. When you’re depressed, you might feel some foot pain. Too much negativity can manifest in your feet not feeling so good. Look for the little joys in life. Find a new pet or a new hobby. Look for joy. 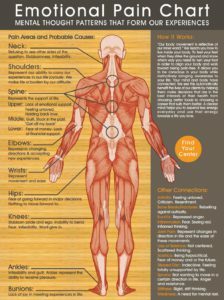 Pain That Is Unexplained In Different Body Parts. The cellular structure is currently being recoded in the human body and in the process it is purging and letting go of predominant resident frequencies that are being eliminated. For this energy to clear, the immune system and actually all systems within the body must be effectively weakened. So while the body may appear to be in a state of illness, it is more or less in a state of clearing. Know that it will pass. Geplaatst in Blog en getagd met holistische visie.